Summer is the perfect time to break out the sweet, floral wines. Their light, refreshing flavors pair beautifully with sultry afternoons speckled with shade trees, glowing evenings spent lounging on porches, and everything in between. Knowing what to pair with these wines can really help bring the whole experience full-circle. So we’ve put together a few wine and appetizer combinations that will accentuate the unique elements of each. We’ve also included a type of frozen fruit we’d suggest slipping into your wine to add another layer of delicious flavor. Plus, it’ll help keep your wine chilled even if the temperature climbs. Contrary to popular belief, rosé isn’t made by combining white and red wine. Rosé is actually created by reducing the time red grape juice soaks in its skins. Once the juice begins to take on that characteristic pink hue, the skins are removed and the juice is allowed to ferment. Rosé exhibits traits of both red and white wine. It typically has the acidity of white wine and the fruit quality of red, making it an easy complement to a wide variety of dishes. But it contrasts particularly well with richly spiced meats and semi-hard cheeses. 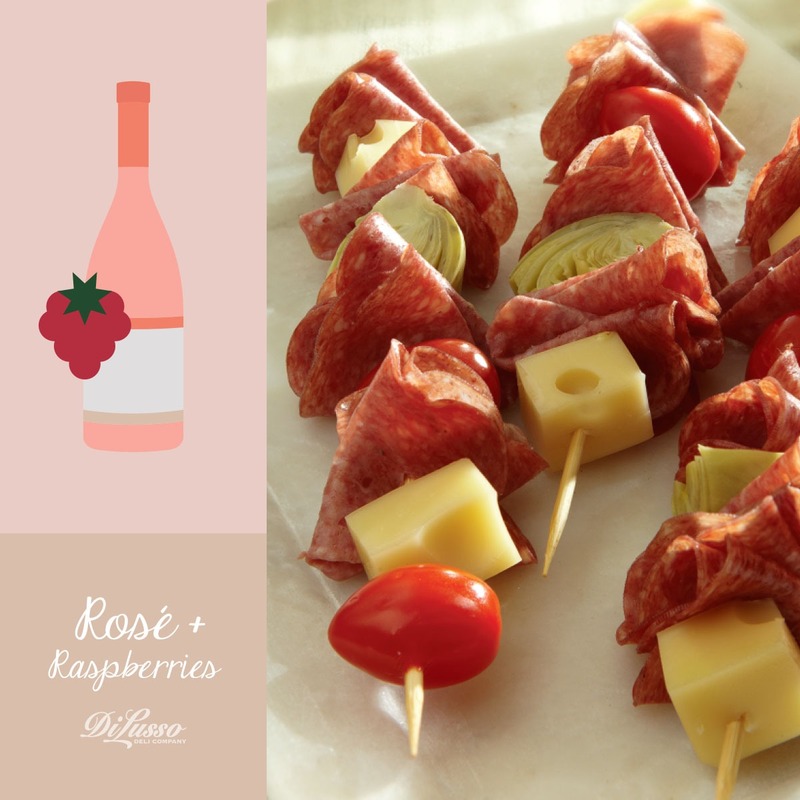 Cue our Antipasto Skewers made with our hard salami and Swiss. Plump cherry tomatoes and sliced artichokes add crisp pops of earthy flavor. Sweet raspberries highlight rosé’s honeyed notes. Born in the Rhine region of Germany, Riesling is known best for its floral aromas, fruity flavors and acidic nature. The combination of sweet and acidic is what makes Riesling a great match for spicier foods, taming the intense heat with a honeyed splash. Think of pairings that have bold, fiery flavors like chipotle, jalapeño, Cajun or cayenne. You might try cooling the heat of our smoked buffalo style chicken and sharp red onions with a refreshing Riesling pour. 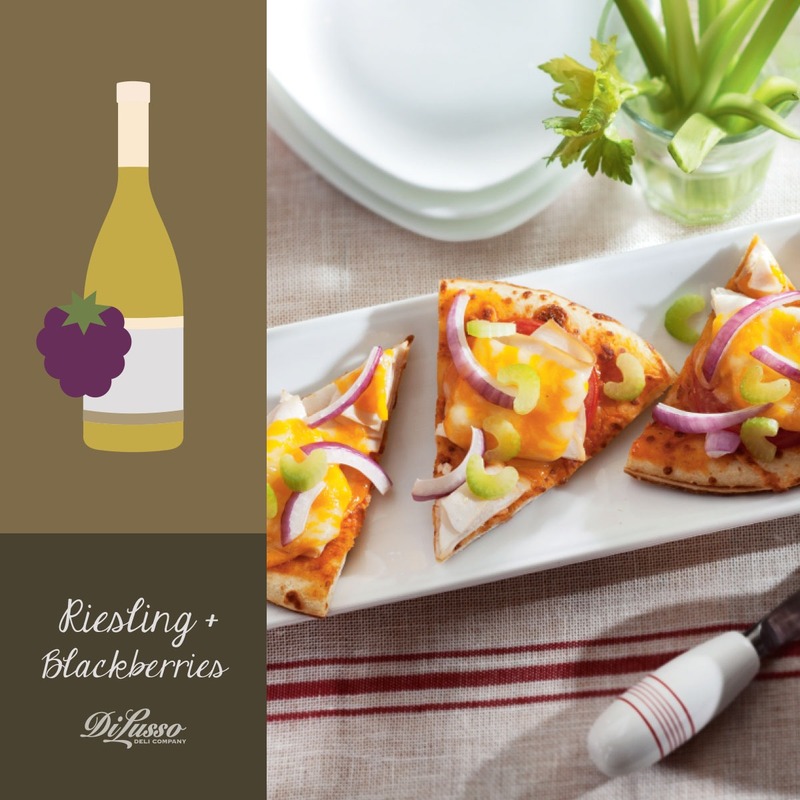 Riesling’s sweetness beautifully complements the tartness of blackberries. Also known as Pinot Gris in its home country of France, Pinot Grigio gets its name from the unique coloring of its grapes. Unlike other white wines, Pinot Grigio grapes are greyish blue rather than green. Characterized by its dry texture, strong acidity and fruity notes, Pinot Grigio really shines when partnered with milder flavors. That’s where our appetizer pairing comes in. Layered with our sun-dried tomato turkey and mozzarella, Roma tomatoes and fresh basil, these bruschetta bites help highlight Pinot Grigio’s distinct characteristics. 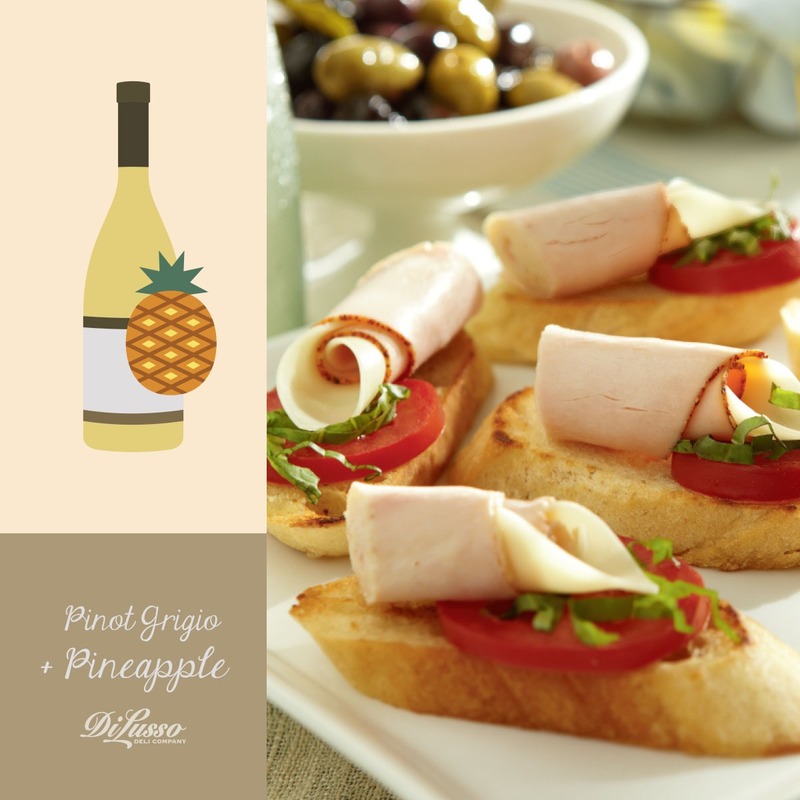 Sweet and very acidic, pineapple helps pull forward the fruity undertones of Pinot Grigio.